It was 7th Jan of 2017, the first Saturday of 2017 and our first event of 2017 too. 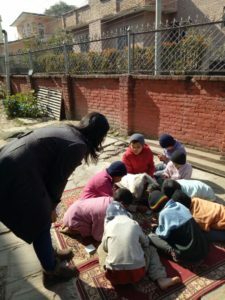 And, we had planned to do some arts and crafts sessions with the children of Aishwarya Children Home which is located at Baluwatar, opposite of the ShivaPuri School, few meters inside from the main road. Shikha, Nimesh, Neha, Shilpa, Abish, Neha’s Dai, Vaauju, Melisa (BFF), Subin, photographer dai, Aishwarya and her mom were already there. I’d arrived a little late at the event. The children were already sitting and ready to get their hands dirty at the ground. And, I was unaware that we were going to celebrate Aishwarya’s birthday there that day. What a pleasant surprise . So, the cake, food and drinks were on their way, the papers, glue and all the materials needed were ready and we were all set to start making beautiful paper flowers. But wait, a couple of fevicol jars seemed to be in need of little bit of water as the glue inside was a little hard and I volunteered to help with the water. And in haste, I managed to make the glue quite runny. Luckily, Vaauju had some extra good fevicol and we added that fevicol to our solution and kept stirring it till it was well a little less runny. 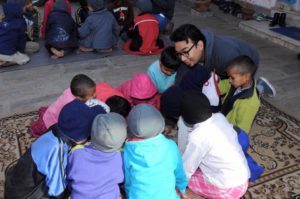 Meanwhile, the guys were keeping the children busy with the picture books and other stuffs. Now we were ready to make some flowers. 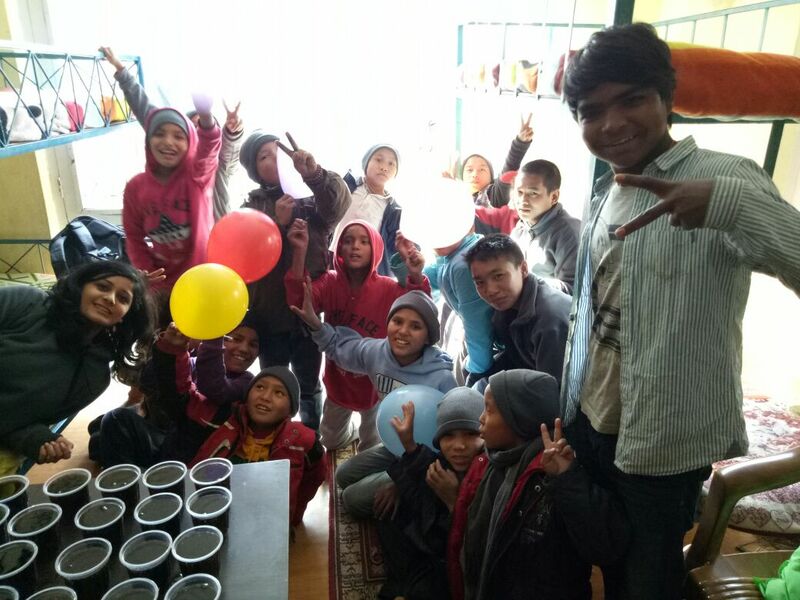 And we divided ourselves into different groups and taught the children to make flowers using paper and some glue. I somehow ended up becoming in charge of supplying glue for making flowers and was running around with the jar, sticking glue to paper petals and leaves, getting flocked with children with their petals in need of some glue. Everyone was having fun and the whole place was bursting with balls of energy everywhere. Some flowers were getting finished and were being placed at the flowerpots like a real flower. 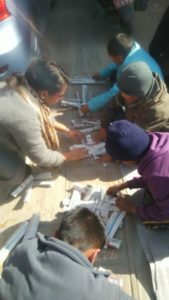 And, a few kids had chosen to make paper mats instead of flowers. candles had been lit and all of us were singing the birthday song. It was fun to watch Aishwarya trying to put out those candles. Everytime she blew them off, they got lit back again by themselves. 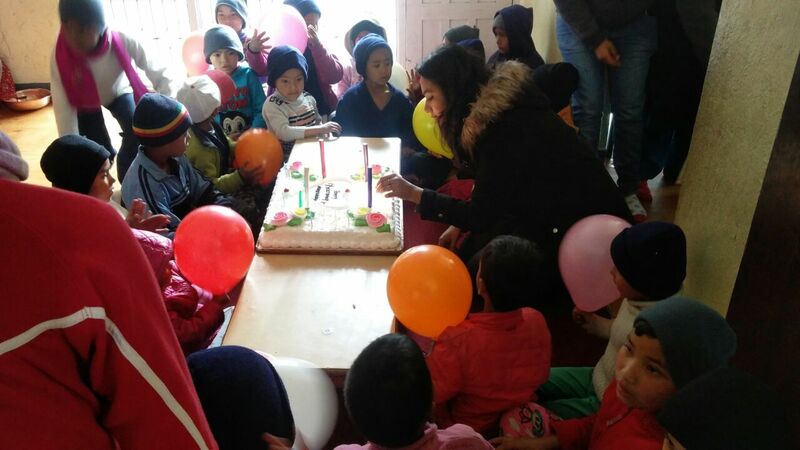 We had to eventually take those self-lighting candles off the cake and oh balloons, we had made balloons too and back to cake, we started cutting the cake into pieces, we didn’t forget to smear the cake on the birthday girl and the honor was done by the mommy of the children’s home. However, later while cutting the cake into pieces, we noticed that we had forgotten to use the candles made of digits “2” and “2”. I think it was her 22nd birthday. HAPPY BIRTHDAY AISHWARYA!! Anyways, it was a lot of fun, I had loads of cake, we all had some Momos and coke. It was a blast. 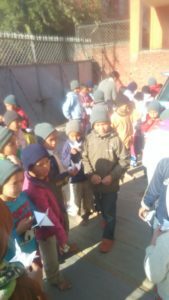 Melisa had this idea of teaching the children to make the origami crane and tell the japanese story behind this crane while the children were busy singing and dancing. Her Nepali isn’t very good since she is based off the United States of America. 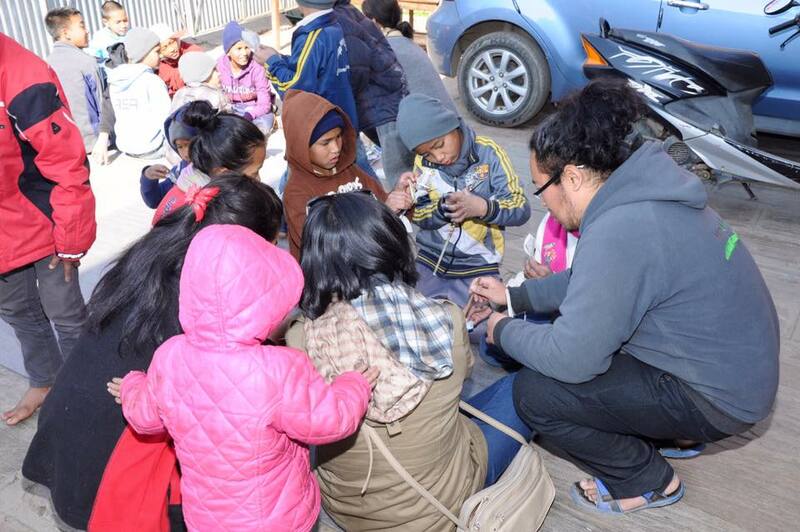 And, she needed someone to translate the story in Nepali and tell them to everyone. And, somehow, I ended up becoming the translator. By the way, this is a true story and this happened during the Second World War. Since our audience consisted largely of children around 6-14 years old, we had to give them a brief background of the World War and the Nuclear Attack on Japan. Here goes the story. After the USA dropped Little Man and Fat Boy on Hiroshima and Nagasaki, both the cities were wiped off the ground and everything within them vaporised with the mushroom clouds. Trees, Birds, Houses, Roads, Men, Women, Children, everything turned to dust in an instance. Countless lives were lost that day. It was the darkest day in the human history. And, the survivors of the Holocaust had to live the rest of their lives suffering from the radiation poisoning of the bomb for many generations, their life a living hell. Among those survivors was a 12 years old girl named Sadako Sasaki. She was suffering from a terminal case of respiratory problems, her lungs were damaged and she had little time to live. She was just 12 years old and her life was already over. She wanted to live, she didn’t want to die. She probably was afraid of death. She was just a little girl who didn’t understand why all of this was happening to her. She just wanted to live her life like a normal kid should live. Then, one day, an old japanese story, well, more of a belief than a story came to her mind. In Japan, there’s a belief that if one makes 1000 origami cranes, his/her wish will come true. And, following her heart, she started making the cranes everyday, as many as she could. But, her condition was getting worse everyday. She could barely stay conscious through out the day, she could hardly make cranes anymore, her breathing was getting shallower and shallower every moment. And, finally, one day, her lungs gave up. She was no more. Her parents were devastated by her death. No parents in this world would ever want to be in the position Sasaki’s Mom and Dad were, would they? But, they were strong enough to accept this bitter truth and move on. They decided to finish what Sasaki couldn’t finish. They made a thousand origami cranes in her memory. The story of Sasaki spread through Japan like wildfire. She represented the children of Hiroshima, the innocence that Japan had lost that black day. And, in honor of this little girl, her statue was built at Hiroshima which still stands tall today. All war does is destroy everything within it’s reach. But, violence is in our blood, it’s human nature, we should be able to control this nature and put a leash on it when necessary. But, when I see news of terrorism and relentless bombardment on places like Syria, I feel like we’ve failed as human beings. Well, at least, I’m glad for these kids, they don’t have to face such horrors here. They are free to play, laugh, smile, learn and become better persons of tomorrow. cranes, they might get to make a wish. All of them were super excited. We distributed the papers and followed Melisa’s instructions. It took some time to explain the steps but eventually the children had their cranes done. Some kids were smart enough to figure out the steps on their own after a few minutes observation while some took all the time they needed. 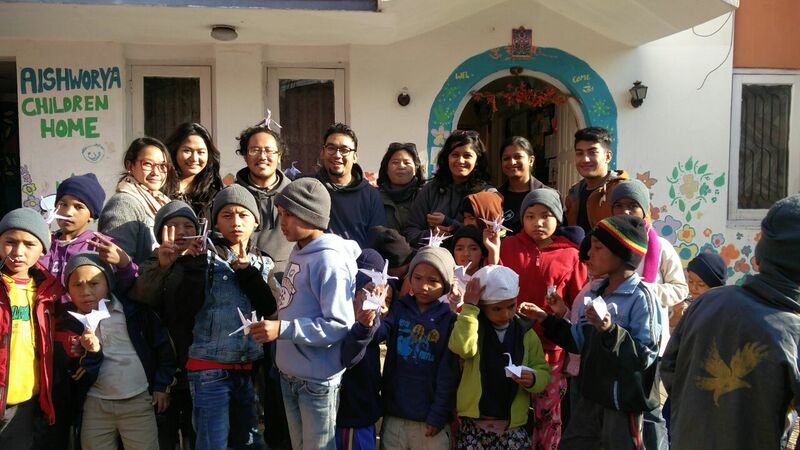 We were nearing the end of the day as we filled the children’s home with lots of paper cranes. The children were singing and dancing. 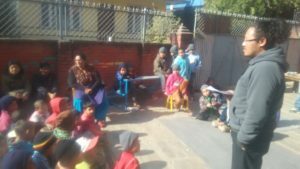 Prakash, a boy living there, who is an actor from a Nepali movie “Kalo Pothi” acted out a scene from the movie for us and he had composed a song too which he sang there. It was time for us to part, we bid goodbye to the children. Birthday celebration of Aishwarya, art sessions, story and origami, the day was so full of fun that I could barely notice time flying by. Now, everytime I see an origami crane, Sadako Sasaki will be remembered.